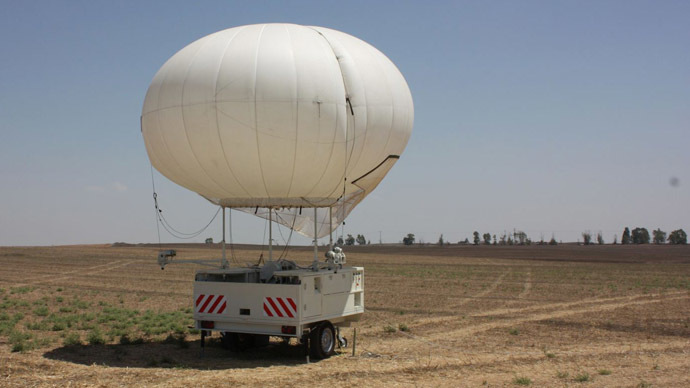 An Israeli surveillance aerostat, extensively used during the latest war in Gaza, has been approved for purchase by the US Army, the device’s producer announced. The aerostat Skystar 180, made by RT, an Israeli firm, successfully passed all the annual Army Expeditionary Warrior Experiment (AEWE) tests, and so got the US stamp of approval. The Israeli firm says its helium-inflatable device can stay airborne for up to three days in any weather, following which it will be ready for use again after a speedy 20 minutes re-inflation break. The spy balloon can mount surveillance day and night. It can also lift a payload of up to 6.5 kilograms and be managed by two people. Israel has deployed surveillance aerostats widely in the West Bank. Aerostats were also used for gathering intelligence during the 50-day war in Gaza in the summer of 2014, which according to the UN resulted in an estimated 2,205 Palestinians losing their lives. Balloon Company commander Lieutenant Orel described how effective they proved during Israel’s incursion into Gaza. “We have the ability to look into the furthest and smallest structures in Gaza. We can detect terrorists and the weapons they’re carrying. The enemy has no idea how much we can see,” he said, as reported on the IDF site.